This fan needs no cords, electricity or batteries. It creates its own energy by using the heat from the Stove or Fireplace. These fans offer outstanding performance and are manufactured to high standards, meeting all EU regulations and CE standards. 2 blade Fan distributes up to 150CFM (Cubic Feet per Minute). This model has updated and improved Bimetalic strip to raise the base of the fan when it starts to get to hot. This will greatly reduce the likely hood of overheating and damaging the fan. This stove fan needs no cords, electricity or batteries. It creates its own energy by using the heat from the Stove or Fireplace. The stove Fan is a self-powered, clean, silent and efficient device that greatly improves heat circulation from your solid fuel burning stove. 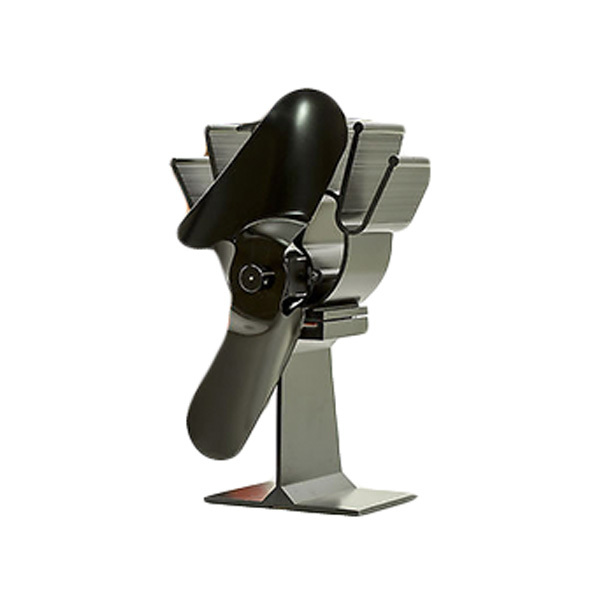 The device is powered by a thermoelectric generation module (TEM) which uses the hot surface of the stove to generate an electric current to propel two fan blades. Heat, instead of rising immediately to the ceiling, is propelled directly into the living space and provides an increased level of comfort and greater fuel efficiency.